Iconic singer-songwriter k.d. 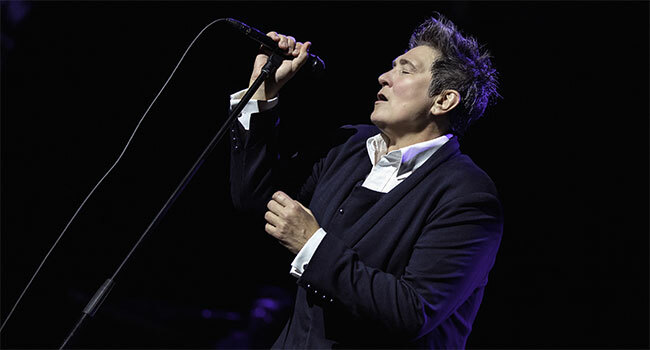 lang performs a 25th anniversary concert celebrating her critically acclaimed 1992 album Ingénue from the Majestic Theater in San Antonio, Texas, in k.d. lang – Landmarks Live in Concert – A Great Performances Special, premiering nationwide Friday, December 14th at 9 pm on PBS (check local listings). Lush and subtle, Ingénue allowed lang and co-writer-producer Ben Mink to explore jazz, cabaret and Tin Pan Alley songwriting, resulting in some of her greatest compositions. This Landmarks Live in Concert special features an uninterrupted performance of the complete Ingénue album, including lang’s GRAMMY Award-winning hit “Constant Craving,” “Save Me,” “Wash Me Clean,” “Season of Hollow Soul” and “Miss Chatelaine.” The concert also includes the beloved Leonard Cohen song “Hallelujah” and a previously unreleased song by lang and Joe Pisapia, “Sleeping Alone.” The special also features an interview with lang by James Reed, an entertainment editor at Los Angeles Times. Twenty-six years ago, k.d. lang was embraced by the music world, its elders (including collaborators such as Tony Bennett and Roy Orbison) and audiences all over the globe for her powerfully emotional voice and often quirky take on country music. The concert will be available to stream the following day via PBS Passport and PBS apps.PBS Passport is a special benefit for PBS supporters to access an on-demand library of over 1,000 hours of quality public television programming. Viewer contributions are an important source of funding, making PBS programs possible. PBS and public television stations offer all Americans from every walk of life the opportunity to explore new ideas and new worlds through television and online programming. Contact your local PBS station for details on PBS Passport. The concert DVD and Blu-ray also will be available December 14th via MVD Entertainment Group. k.d. lang’s Ingénue: 25th Anniversary Edition was released by Nonesuch Records last year in celebration of the double platinum-selling, GRAMMY Award-winning album’s silver anniversary. The two disc set includes remastered versions of the album’s original ten tracks as well as eight previously unreleased performances from lang’s 1993 MTV Unplugged episode, recorded in New York City’s famed Ed Sullivan Theater. Created by documentary and live event producer/director Daniel E Catullo III, Landmarks Live in Concert features a lineup of global music superstars performing at landmark locations of either historical or personal significance around the world. Past episodes featured Alicia Keys at multiple locations around New York City, Brad Paisley at West Virginia University, Andrea Bocelli live at Florence’s Palazzo Vecchio, Foo Fighters at the Acropolis in Athens, Greece, and will.i.am with the Black Eyed Peas and friends at London’s Royal Albert Hall.